Jetties beach is the closest large beach to town ( about 1 mile ). It is a family friendly beach on the Nantucket Sound side of the island with calm, warm waters for swimming. There are lifeguards, public restrooms, food service, play-area and volleyball nets as well as many other activities available here. Reached by riding on the street. Dionis beach again is located on the northern shore of the island, it is a slightly longer ride from town ( 3 miles ), with calm warm waters for swimming. It is more suitable for children. There is a lifeguard, restrooms, showers and parking near to the beach. There are no food facilities there. It can be reached mostly via bike path with a small portion of street riding. Madaket beach is a beautiful beach at the furthest west end of the island. It is a long ride from town ( 6 miles ) but is nearly all bike path apart from a small distance on the street to start. There is a lifeguard and restrooms but no food available. There can be very heavy surf here so take caution when swimming. It is famous for it’s beautiful sunsets. Located on the southern side of the island, a moderate ride from town ( 4 miles ). Cisco beach is bustling beach in the summer time. Popular with surfers the annual ‘Ozone Classic’ competition is held here. Heavy surf can be common. There is a lifeguard but no other facilities. There is a bike path to Cisco Beach. 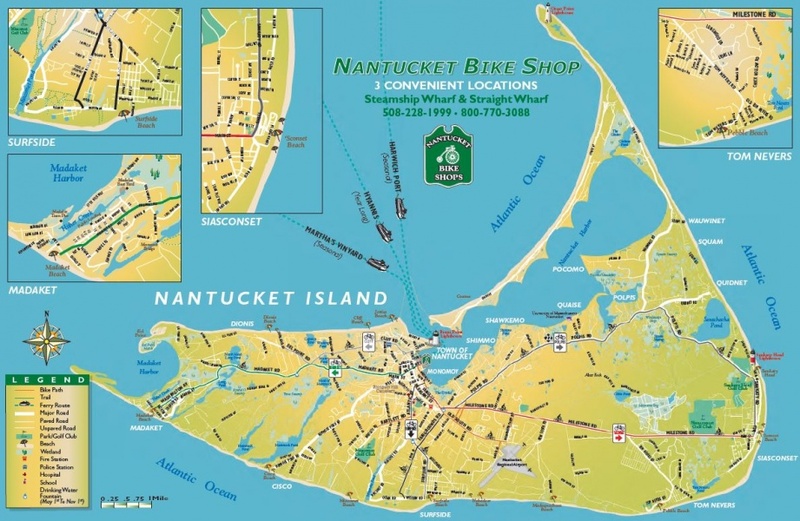 Surfside beach is on the south shore of Nantucket, an easy ride from town ( 3 miles ). It is very popular in the summer. There is a lifeguard, restrooms, parking, plenty of bike racks and public phones. A wide beach allows for beach games to be played easily. The surf can sometimes be heavy. Surfside beach is reached easily via bike path for most of the way. A little on street riding is required at the start. Tom Nevers beach is a slightly more remote beach with coarse sand and gravel. It’s a long ride from town ( 5 miles ). The surf can be very heavy and beach access is sometimes difficult. There are no facilities or lifeguards at Tom Nevers and there is currently no bike path. The annual fair is held nearby at the old Navy Base. Located at the eastern most tip of the island ‘Sconset’ has a wide beach. It is a long ride from town ( 7 miles ). Surf can be heavy with strong currents so take care when swimming. There is a lifeguard but no food facilities at the beach. However food is available in the nearby village. Sconset beach can be reached either from Milestone road bike path or the slightly longer Polpis road bike path. There are of course many, many miles of other beautiful beaches on Nantucket. However these are the most popular and most easily accessible by bicycle. You can of course take a ride though and maybe discover your own little quiet piece of paradise!